In 2014 as part of the 150th commemoration of the Battle of Westport, I participated in a bus tour of the Battle of Westport led by Dan Smith, chairman of the Monnett Battle of Westport Fund. This bus tour covered the entire three-day battle. 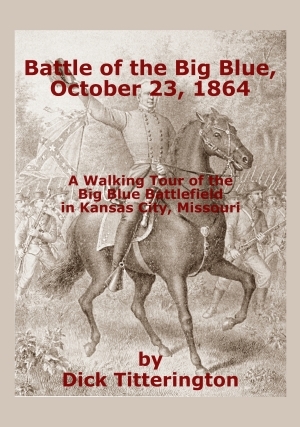 We started east of Independence, Missouri, on the Little Blue River before moving west toward the Big Blue River. But there was one location where we only got an obstructed glimpse of the battlefield. 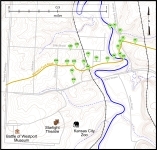 It was the Byram’s Ford Road on the east side of the Big Blue River in Kansas City, Missouri. Dan took the bus down E 58th Street, which dead ended at a railroad cut. Turns out there used to be a bridge over the railroad tracks that entered a small subdivision. Years ago the bridge had deteriorated so much that Kansas City officials decided it was cheaper to buy out the owners of the subdivision and tear the bridge down. So Dan told us E 58th Street on the other side of the railroad cut generally followed the route of the Byram’s Ford Road, continuing on down to the river and Byram’s Ford. Well, I decided I wanted to get a better look at this part of the battlefield. So I invited a friend of mine, Joseph Cross, to go out and find the Byram’s Ford Road on the east side of the Big Blue River. So we went to the end of E 58th Street, walked down to and across the railroad tracks, and up into what used to be that subdivision. Then we walked west down the old road bed of E 58th Street. We wandered around in the woods for a bit until we stumbled onto the old Byram’s Ford Road, really overgrown but clearly marked by shallow drainage ditches on either side of the road. We followed the road down to present-day Hardesty Avenue, not any easy task with all the bush honeysuckle, fallen trees, and uneven ground. We knew we were in the right place, for, as I found out later, there were some metal stakes painted orange at the point where the Byram’s Ford Road met Hardesty Avenue. Well, we finished our survey of this part of the battlefield and Joe and I parted ways, going home. But I couldn’t get this stretch of the Byram’s Ford Road out of my mind. I was eager to go back there and clear out all of the brush to make the area more accessible. So on Thanksgiving Day in 2014—my wife is a nurse and had to work that day—I grabbed a hand saw and some loppers and headed out to start clearing the brush on the old Byram’s Ford Road. I finished the brush clearing that fall and winter. It seemed the next step was to create a walking tour to cover the battlefield on the east side of the river. 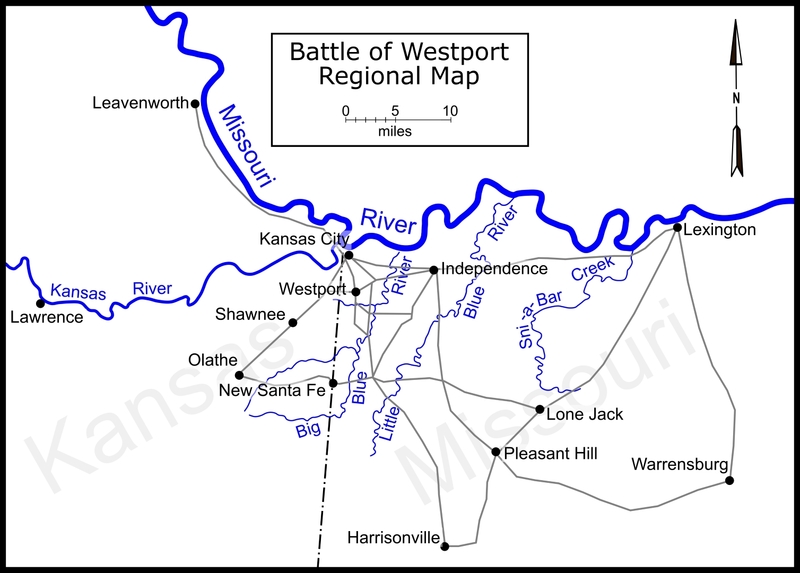 For the past couple of years, I just printed it out myself and provided copies to the Battle of Westport Visitor Center and Museum. During the fall and winter of 2017, I will be doing some trail maintenance and installing trail signs. Later this year, I will be publishing a revised walking tour via Trans-Mississippi Musings Press. The tour is broken into two geographical areas separated by the Blue River. You will drive to the first stop in each area, which is a starting point for a number of walking tour stops. There are a total of 21 tour stops in the tour. During the walking part of the tour, you will find the trails range from easy to moderate in difficulty. One thing to keep in mind is what time of year you choose to take the tour. Since the battlefield is an ongoing restoration project, trees and their leaves can obscure your ability to see terrain features. So late fall, winter and early spring, when there are no leaves, are really the best times to visit the battlefield. We strongly recommend you wear sturdy hiking boots or shoes and long sleeves and pants. 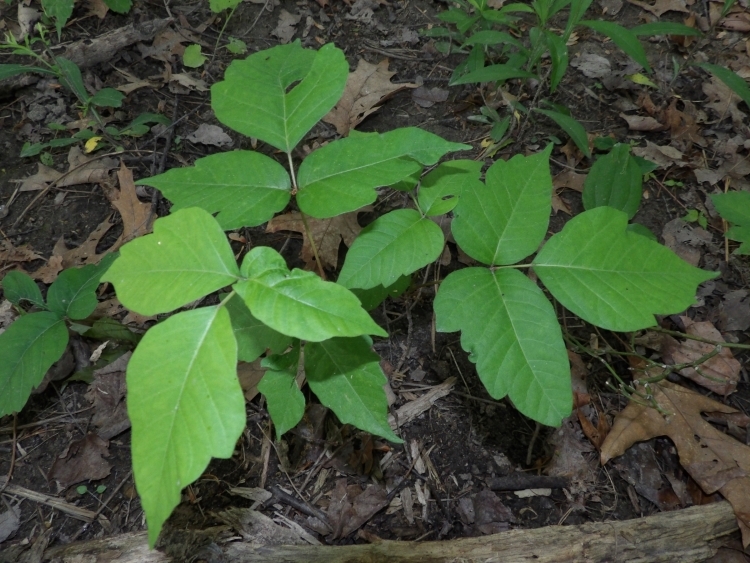 During the warm weather months, you should use insect repellent (primarily to discourage ticks) and be on the lookout for poison ivy, which is very common in Missouri’s woodlands. The complete walking tour covers a little over 4 miles, and there are a few stretches of walking up or down some pretty steep hills. 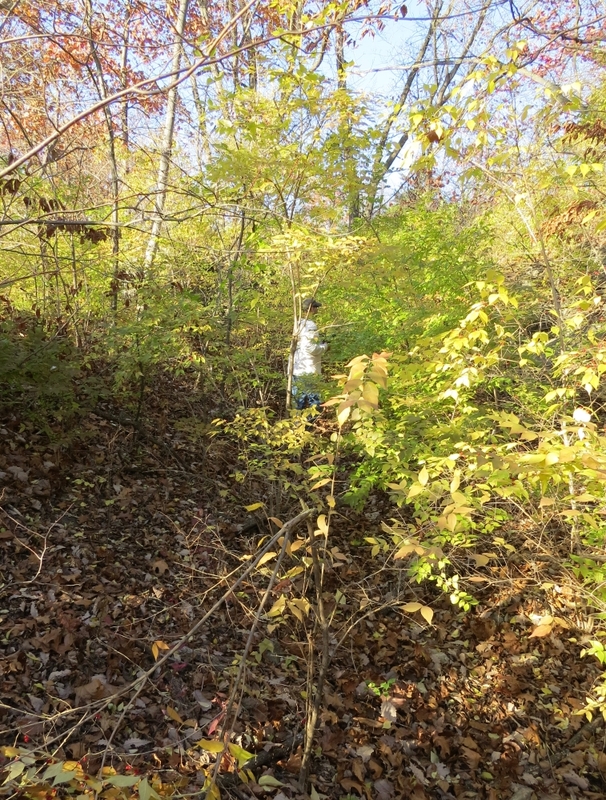 My friend Joseph Cross on the Historic Byram's Ford Road prior to clearing brush. 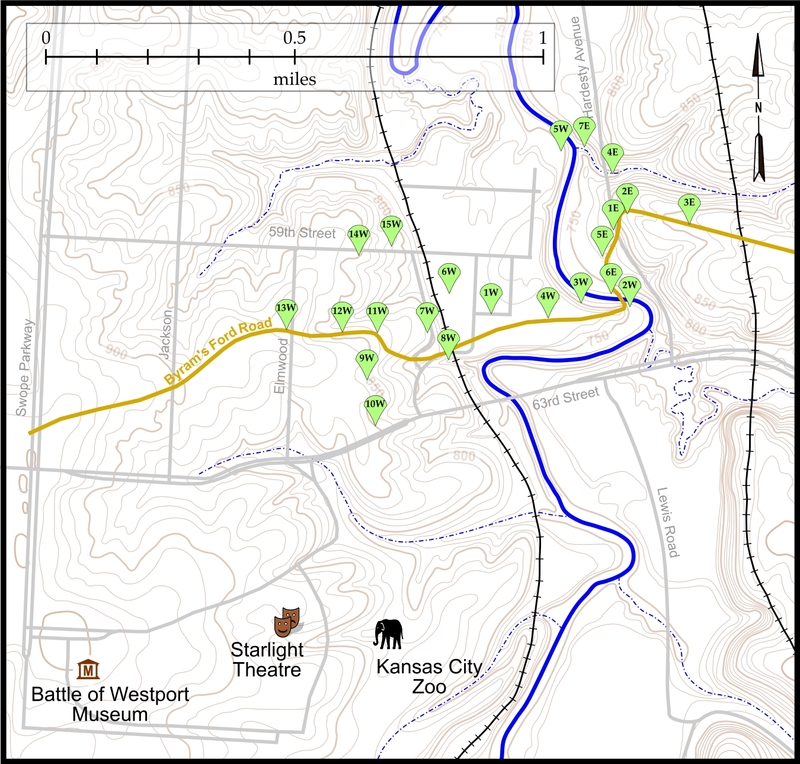 Map showing the Big Blue Battlefield walking tour stops. Click on thumbnail to load high resolution version of map. 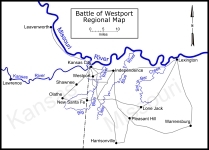 Regional map of Independence, Westport and Kansas City. Click on thumbnail to load high resolution version of map.